Metal Inert Gas welding (or MIG welding) is used in the industry more than any other form of welding because of its simplicity and effectiveness. Essentially, the machine does a great deal of the work. Stick welding requires greater technical skill, and TIG welding is a significantly slower process. In fact, MIG welding is five to six times faster than any other form of electric arc welding. Moreover, it allows even novice welders to create strong welds with a high level of structural integrity. 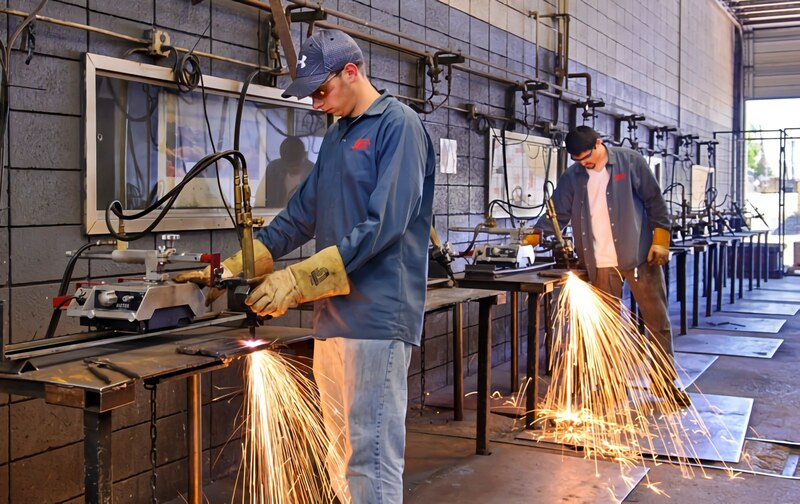 However, observing certain safety measures is absolutely essential in order to practice welding and ultimately to earn your MIG welding certification. First, always have a partner working alongside you or even just observing. In case of an emergency, someone should be on hand to help you in case you are incapacitated. You and anyone working with you should always know where the telephones, first aid kit, and safety equipment stations are located. Before you heat up the torch, clear away any paper or plastic lying in or around the area. Molten sparks generated by the welding machine may cause these items to catch on fire or melt. Wear proper protective clothing. Leather is the preferred material, followed by wool and then cotton. Cotton gear is often treated with a fire-resistant chemical so it won’t ignite. Synthetic materials should be avoided as they may melt. Also wear leather insulated welding gloves, and make sure that long hair is tucked inside the jacket. Before putting on the helmet, make sure to cover all exposed skin, particularly the neck and arms. Otherwise the intense light will cause sunburn. The helmet has a protective lens that immediately darkens when the torch is ignited, but you can adjust the darkness or clarity yourself as needed. If you are not looking through a dark enough lens, however, the ultraviolet light will cause severe retina burns. These will heal, but they will be very painful in the meantime. Make sure the torch you are working with is cleaned out every time you begin working with it. It is standard to leave torches dirty after working with them because they become extremely hot and need to cool. As this happens, carbon buildup and small metal pellets collect inside the nozzle and around the tip of the torch. If these are allowed to accumulate, a dangerous concentration of heat may develop at the mouth of the torch that will cause it to overheat and cause a malfunction. If the torch has been properly treated, it shouldn’t need more than a wipe down. If the buildup cannot be wiped away, the tip may need to be replaced instead. The nozzle needs to be cleaned out as well with special MIG pliers. These are used to scrape the carbon and metal buildup from the inner side of the nozzle. The serrated grip of the MIG pliers can also be used to help grip and remove a stubborn nozzle or tip, the side cutters can trim excess wire, or you can use the pliers to pick up and move a hot part without touching it. After the tip and nozzle have been wiped down, they should be freshly treated with grease to prevent excessive buildup during the next welding session.